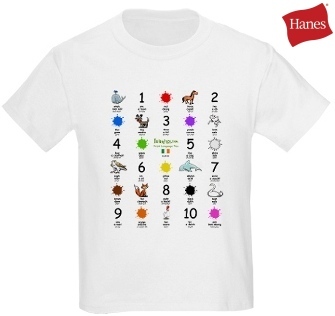 Just for kids (ages 3 - 10), we have fun t-shirts to help seed an awareness of a new language. Featuring nine colourful and beautifully illustrated cartoon animals, ten colours and the numbers from one to ten. Words are shown below each picture, first in English, then in the new language and then spelled phonetically to aid pronunciation.